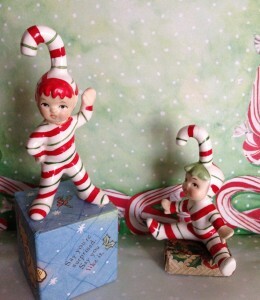 My mom hung these mischief makers a small white tabletop Christmas tree in the ’60s. They were very stylish to my young mind. 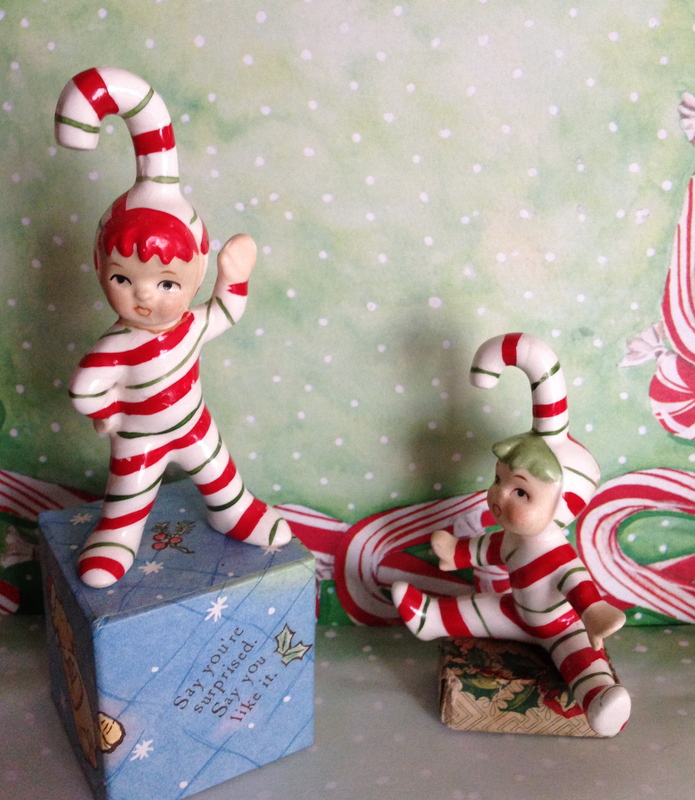 The tree is long gone, but the elves live on. 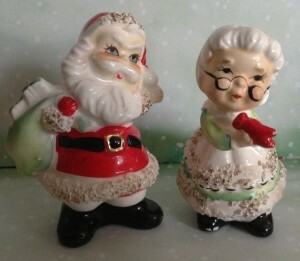 Santa and Mrs. Claus salt and pepper shakers, 1960s. These two were always on our Christmas table. The Sugar Plum Fairy was one of the first tree ornaments I remember . At least she was one of the only ones I was allowed to handle, the others being fragile glass. The other one I could play with was a carved wooden St. Bernard. The dog was chewed in half by Daisy as a puppy. I should have been more careful. 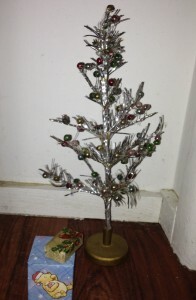 The ever-classy tinsel tree. This one is about 10″ high. 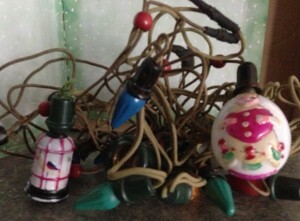 This hot mess of wires and bulbs is from the 1930s, or possibly the 1920s. The lights worked when I was a kid, but the cords have been taped so many times I’m afraid to plug them in now. I was always fascinated by the egg-shaped Old King Cole bulb, and the birdcage bulb, on the right. Too bad I can’t use them! 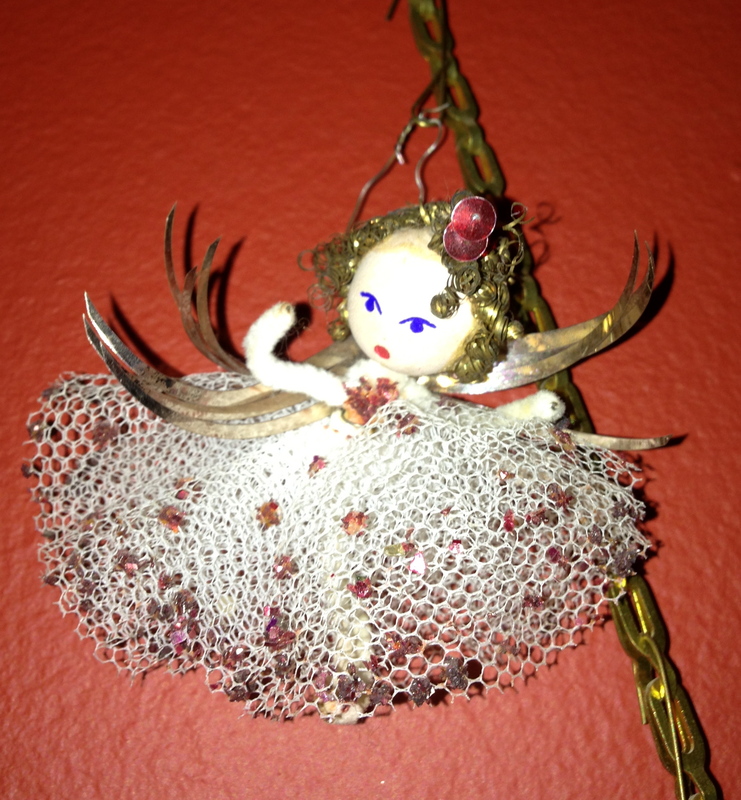 This entry was posted in Holidays by Celayne. Bookmark the permalink. I don’t remember all of those decorations. Amy, which ones don’t you remember? I kind of remember the angel, but it’s not a vivid memory and I don’t remember those lights ever being lit. There are probably things you remember that I don’t.